Situated in a privileged location between a nature reserve and a superb sandy beach, the Grupotel Parc Natural & Spa brings you a taste of the true character of Majorca. Set in lush tropical gardens the hotel also has a splendid pool where you can relax on the lawn in the shade of the trees. For those who prefer a dip in the sea the hotel leads directly onto the fine white sands of Playa de Muro. The rooms are comfortably furnished, and the personal service will ensure that you feel at home. If you wish to venture further afield there are regular local bus services to Alcudia, Palma, Ca'n Picafort and Puerto Pollensa. Hotel child prices apply to ages 2-12 years. Specially modified rooms for people with reduced mobility are available on request. 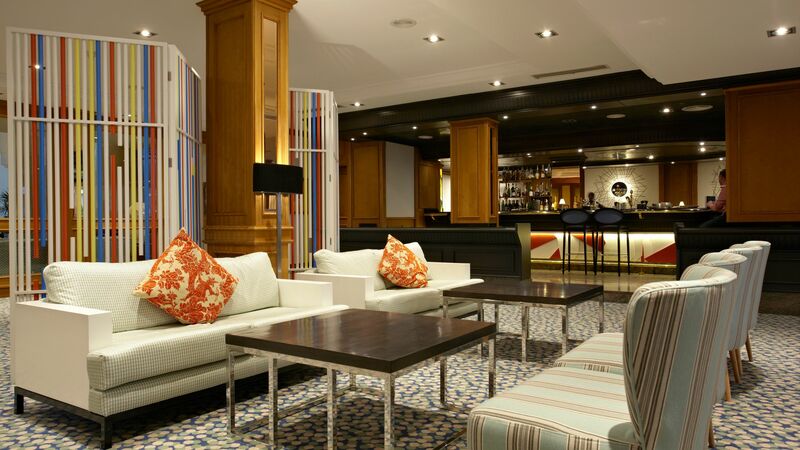 Serving a selection of beverages on the terrace or in the lounge with live music and shows. Serving delicious crisp salads, seafood, meats and fish, tapas and pasta dishes. Offering a varied hot and cold buffet breakfast, live cooking stations, weekly themed evenings and a table d'hôte in the evenings. Gentlemen are required to wear trousers and long-sleeved shirts for dinner.. 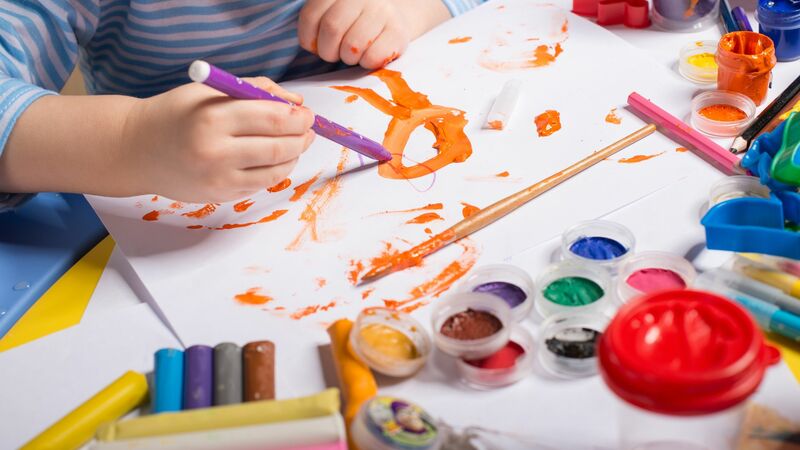 There is a Kids' Club available for children aged four years and over during high season as well as a playground and children's pool. Guests can relax at the Wellness Centre offering a heated hydro massage pool, thermal bath, sauna, Turkish steam bath, sensation showers, fully equipped fitness room, hairdressing salon and many treatment rooms. Access to the pool area and fitness room is free of charge. Guests over the age of 16 are welcome to use the fitness room. 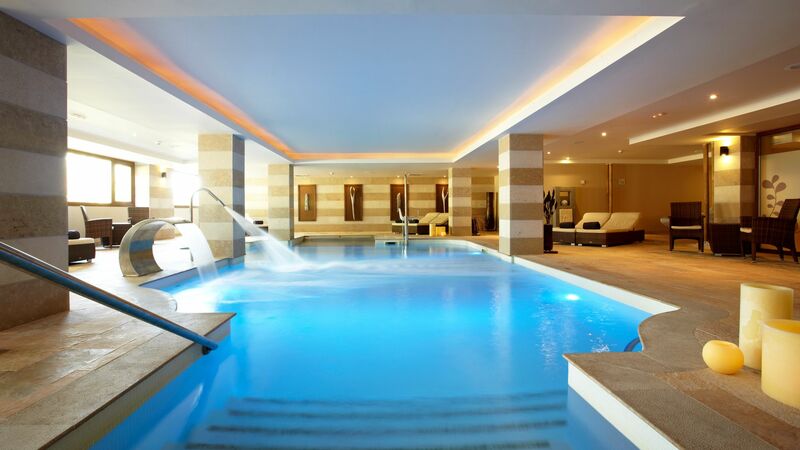 Guests up to the age of 13 years old are welcome to use the indoor pool accompanied by an adult until 16:00. This dreamy beach resort on Majorca’s north coast curves around the Bay of Alcudia, flanked by golden dunes and juniper trees. Playa de Muro moves at an easy-going pace; life here mostly revolves around the beautiful Blue Flag beach, serving up silky white sand and calm, clear waters made for swimming and snorkelling. A cluster of upmarket shops, bars and restaurants brings a chic vibe to this otherwise low-key resort, with a smart palm-lined promenade hosting a sociable nightlife scene, where you can sip sangria and watch live music. If you fancy some more action, popular Alcudia is just 10 minutes along the bay. Twin Premium Rooms have twin beds, shower, WC, hairdryer, bathrobes, air conditioning, satellite TV, radio channel, minibar, IDD telephone, bathrobes and slippers, safe and a balcony or terrace with views of the pool or partial sea views. Single Garden View rooms are spacious offering plenty of space to relax. Suites with Side Sea or Pool View have a separate lounge with a second TV and a sofa-bed. Some suites have a second bathroom. Twin for Sole Occupancy rooms have a shower, WC, hairdryer, bathrobes, air conditioning, satellite TV, radio channel, minibar, IDD telephone, bathrobes and slippers, safe and a balcony or terrace. Save up to 5% on the hotel price for holidays between 12 April - 26 October 2019 booked by 28 February 2019. Honeymooners receive a bottle of sparkling wine on arrival for holidays between 12 April - 26 October 2019. I?? ?m two days into a week away with my kids and I already know I should have booked a month! The suite is perfect, location surreal however it is the staff that are BRILLIANT! From our welcome, to the team at the spa/pool and then to the restaurant team! I travel hard for work across the world and enjoy many great places however this place is lovely! Bring on my next 5-nights! Hotel set on Playa Muro, a beautiful and expansive sandy bay, and warm clear water. As an extra treat there is a creek running into the sea from the park which offers the regular sight of jumping fish! The hotel is set in lovely grounds, and never feels overcrowded. The gardens are beautiful. This was our 5 th visit to the hotel in 10 years and it continues to be as good as ever. On this occasion we were even offered a room upgrade - a very welcome addition to our holiday. There are so many staff who have worked at the hotel for a number of years, and who talk about being part of a team and who?? ?s aim is to make your holiday experience as good as possible. As the manager said to us one evening he tries not to have problems only solutions to a problem. The food at the hotel has remained as good as ever, with a wide selection of freshly prepared foods at the buffet, an excellent choice of meats or fish cooked on the grill as you wait and the most amazing array of desserts. If preferred there is also a choice of three main meals from the menu which includes a meat, fish and vegetarian option. There is always a wide range of fruit and guests are encouraged to take some each morning after breakfast. Whether single, a couple or family, everyone is made to feel welcome and valued as a guest. Stayed here two weeks, were welcomed with a bottle of wine and a plate of fruit in the room. Very clean and comfortable rooms, a bit surprised though over the poor quality of the blankets, but sheets lovely. The food (we had breakfast and dinner) was excellent!! The staff is so very friendly and attentive, the best ever!! We had a rental car and the parking outside was easy, always an empty space. Too bad the sunbeds on the beach are so expensive, but not the hotels fault since they don?? ?t own them. This is really a nice place to stay, they make you feel very welcome! We came to this hotel for 6 nights having not been to Majorca for several years. 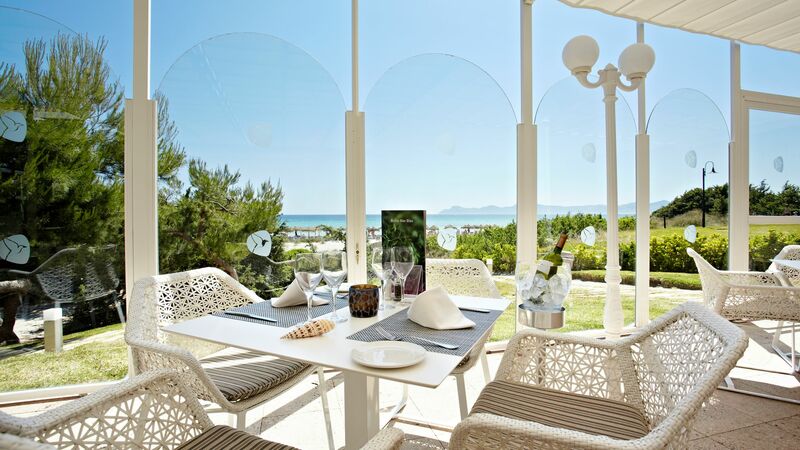 Ordinarily we have stayed in the south of the island but due to a family wedding we wanted to say close to Alcudia and Pollenca for which this hotel is ideally situated being some 20 mins to each place by car. The hotel is spotless and we were particularly impressed with the grounds which are very well maintained and especially the pool area which is large and offers plenty of shaded areas. We had a double bedded room with a "lateral" sea view. It wasn't cheap but the room was spacious and although there was no bath, the shower was excellent as, were and for a change, the large bath towels something that you don't often find. There is a pathway to the beach from the hotel but it is NOT the hotel's beach and there is a daily charge (4.25 euro's) for a sun bed + if you wanted an umbrella and a safe. We had a bed and breakfast deal but we had lunch at the restaurant situated between the pool and the beach where there was an extensive menu even though the portions were not overly generous. The shame here is that with such a beautiful setting and view, the restaurant is not open either for breakfast or dinner as it does not open until 11 and closes at 6. One night we fancied an early dinner at 6 and it took some time for them to reluctantly agree to serve us hot food. Breakfast is in the large indoor restaurant and although the buffet was excellent (thank you Peter for an outstanding omelette! ), the setting and the fact that you are indoors is a shame. The staff and particularly at the reception desk were extremely helpful and we appreciated that they gave us a later check out time give that our flight back to the UK was not until late afternoon. All in all we would recommend this hotel both for families and couples but where it is situated is a little isolated and the nearest area, Playa de Muro is just full of "tut" shops and bars. Highly recommend the old towns of both Pollenca and Alcudia, great to walk around and some excellent restaurants.